Birth date and place c. 1819 Thurles, Tipperary, Ireland. Physical Description Height: 5 ft. 8¼ ins. Complexion: fresh. Eyes: blue. Hair: dark brown. 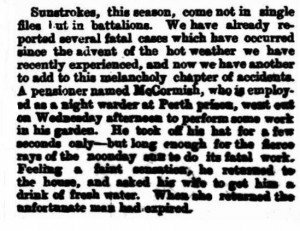 Death date and place 7 Jan 1880 Perth, Western Australia. Cause of death: Heart disease & sunstroke (death registration). 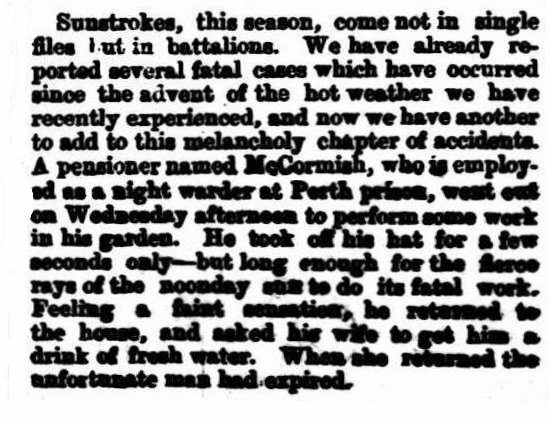 Heat apoplexy (inquest in Government Gazette). Burial date and place January 1880 East Perth Cemetery, Western Australia. Will and Probate Letters of Administration: 2 Dec 1881. Probate: 3 Jan 1882, Supreme Court of Western Australia. Death Notices and Obituaries West Australian 9 Jan 1880 (as McCormish). Regiment(s) 19th (1st Yorkshire North Riding) Regiment. Regiment No. and Rank #1125 Private. Attestation date and place 28 Feb 1838 Templemore, Tipperary. Service/Campaigns Mediterranean 5 years 3 months. Turkey 4 months. Crimea 2 Sep 1854 to 7 Apr 1856. Casualty/Medical Right ankle much weakened and his power of moving it much impaired, in consequence of his tibia having been fractured by a grape shot at about 3 inches from the lower extremity, and (he stated) previously grazed, but not broken, by a musket bullet which he states struck him about the same part. He states that the other leg was also grazed by a musket ball, just below the calf but there is scarcely any sign of it. Wounded on Sep 8 1855 in the final attack on Sebastopol. Unfit for further service. Regimental Courts Martial Tried at Camp Sevastopol 23rd January 1855. Crime: losing through neglect a quantity of saddlery the property of Surgeon Longmore 19th Regiment. Imprisonment 22 Jan – 23 Jan 1855. 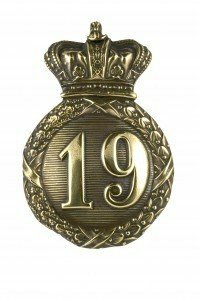 Length of Service 18 years 95 days. Post Discharge Residence Greenbank Street, Wapping, London. Pension Amount Increased to 1/3d. per diem 4 Jun 1878 for service EPF. Status/Occupation Enrolled Pensioner Force ? 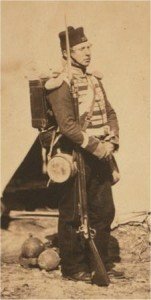 Received gratuity of £2 for performing duties as Warder on board Sultana [Henry Richardson, Surgeon Superintendent’s Journal]. Assistant Warder & Warder [Barker p.42-43, 134].